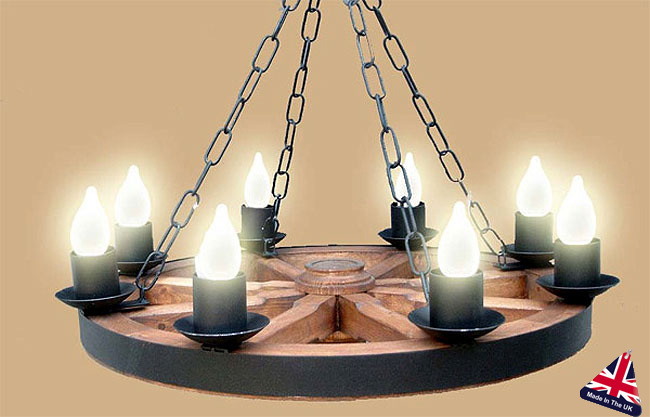 From our wrought iron Gothic lighting collection. Handmade to the highest quality in the U.K. A quality feature wrought iron cartwheel chandelier made from wood in the traditional horse and wagon wheel style. With a diameter of 600mm this impressive Gothic wrought iron ceiling light has a centre wrought iron band and eight wrought iron lamp holders, suspended from four heavy chains. This chandelier is made to order so please allow up to four weeks for delivery.